One month down and eleven to go! I hope this issue finds you and yours happy and well. This month, a visit to a local museum stirs memories of coming of age during the Cold War. If you’re a Baby Boomer, you’re sure to remember the phrase “Duck and Cover.” It’s what our government told us to do in order to protect ourselves during a nuclear attack. As if diving under our wooden school desks after seeing the flash of a nuclear explosion would save us from annihilation! This was the time of the Cold War, of course, when the Soviet Union and the United States had each other targeted through atomic crosshairs. One of the strategies that kept the two sides from vaporizing one another was the doctrine of Mutually Assured Destruction, or MAD, which meant that the survivor of a first strike would still be able to decimate the attacker. From 1963 to 1968, the U.S. weapon designed to insure against a Soviet nuclear attack was the Titan II missile. This lethal piece of technology was housed in fifty-four hardened silos spread among three states, eighteen to a state. One of those states was Arizona, where the only remaining Titan II site open to the public still exists. 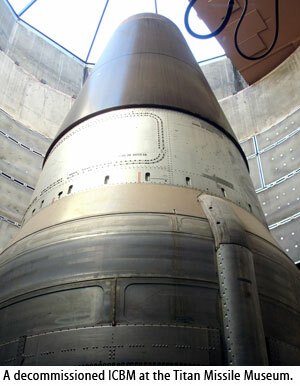 It’s called the Titan Missile Museum and it’s just a half-hour’s drive from Tucson. I recently visited the museum with a friend. Entering a small building housing a gift shop, we bought our tour tickets and browsed through some displays of Cold War photos and memorabilia before we were ushered into a small briefing room. The historical stage was by our tour guide through a combination of lecture and video. Then, we grabbed our hard hats and headed for the nearby missile complex. We descended a set of concrete stairs, passed through massive blast doors and entered the control room once used by Air Force missile crews. Surrounded by racks of now antiquated electronics, we learned about a missile crew’s daily routine and experienced some of the sights and sounds that would have occurred had a message to launch ever come through one of the “squawk boxes” attached to the commander’s console. We were then ushered through a low passageway to the silo itself, in which a Titan II missile, now drained of fuel and topped with a mock-up of a nuclear payload, still points toward the sky through the partially-opened silo cover. Thank goodness we never fired these things in anger. Back in the museum gift shop, my friend and I laughed at some of the relics for sale that included vintage geiger counters, radiation detectors and even cans of water that once lined the shelves of bomb shelters. We also shared our memories of growing up during the dawn of the Nuclear Age and our thanks that cooler heads prevailed, allowing us to grow to adulthood instead of disappearing as youngsters in a flash of light and heat. You may want to include your memories, or those of your parents or grandparents, of life during the time of the “The Bomb” and the Cuban Missile Crisis in your next video biography. And if you get a chance, I highly recommend a visit to the Titan Missile Museum. Ask Steve – This month: An unsolicited compliment. I recently produced a couple of legacy videos for a local company and was intrigued by the business and began researching it. I came across your website and I must say I’m very impressed with your business model. It appears that you are and have been successful at it for some time. The quality of your work is the best I’ve seen. I can tell you put a lot of work and effort into your productions, good for you. The main focus of this email was to tell you how impressive your site is with information, videos and newsletter. I think you are providing a great service to the public. I wish you the best of luck with your business. Got a question or comment about any aspect of family history video production?